Dive deep in the Inner Studio of mind via meditations. Create new in the Outer Studio of life. Meditation, or Dhyana in Sanskrit, is the process of quieting the mind in order to unlock energies for creative pursuits. Conducted in a group the pooled synergies of participants are even more dynamic and productive. The relationship between art and meditation is intimate and can be expressed in many ways. Meditation helps in creativity. Art is a form of meditation. Meditations 2019 is an inclusive season for those artists, writers, and creatives who are now ready to take their creativity to the next level and consider spirituality to be a driving force in their work and life. This includes, but not limited to – painting, drawing, mixed media, digital media, writing, textile arts, interiors, fashion, sculpture, design, photography, video, music, dance etc. The following could be some of the intended outcomes of participation with Meditations 2019. The total cost of this comprehensive residency is USD 4350. However, of this amount, a selected artist needs to pay only USD 2850 before arriving in India. This can be paid in 2 parts – USD 1000 within 2 weeks of the acceptance of the offer-letter and balance USD 1850 by 15 December 2018. Two types of grants amounting to USD 1500 are available to every selected artist. One is the ‘Inner Grant’ of a maximum of USD 1068. This is entirely granted by a selected artist to herself. The other is ‘Outer Grant’ of a maximum of USD 432. This is determined using ancient Indian astrology system. It could be anywhere between USD 0 to USD 432. An artist may pay (if she does not receive all of the USD 432) the balance, purely on voluntary basis, upon arrival in India. 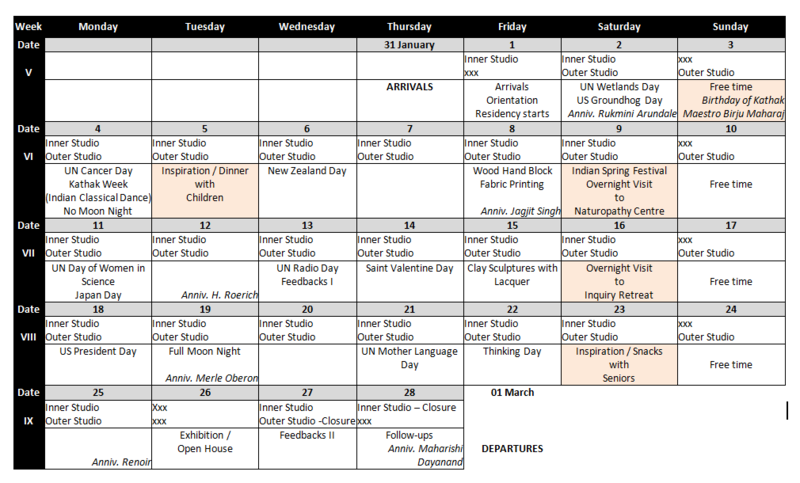 Tentative schedule for the month can be seen here. Tentative schedule for a typical day can be seen here. 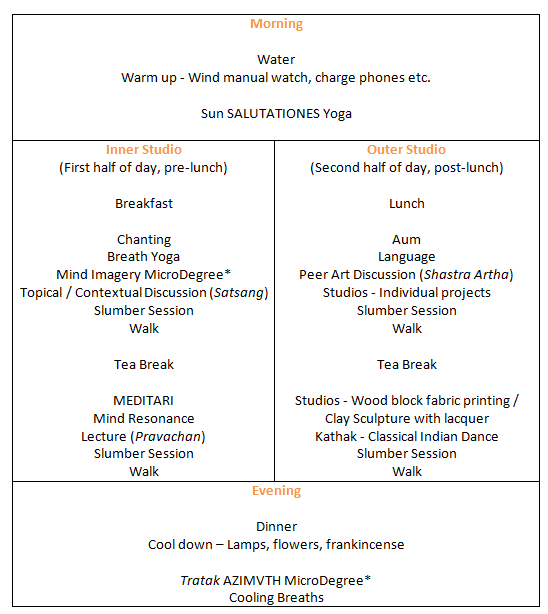 At Meditations 2019, a day is broadly organised in two halves – before lunch for Inner Studio and after lunch for Outer Studio. God is the Creator of all things and for an artist this temple of human body is the ‘Inner Studio’. Participants explore their inner energies in the Inner Studio. Depending upon the profiles of the selected artists, many esoteric techniques are learned and practiced. During the second half of each day, participants work more directly with fine arts in the Outer Studio. Specific opportunities are created to expose the participants to some unique Indian art forms. Kathak is one of the main classical Indian dance form. A renowned Kathak artist and instructor will give sessions during Meditations 2019. Wood block printing is an old craft. Patterns are manually etched by master artisans in wood blocks. And these are dipped in colours and pressed on fabrics in a repetitive way. Jo Khandai is a rural craft form. Small clay sculptures, after processing through a make-shift kiln, are painted with lacquer. Sun Salutationes is a form of Vinyasa Hatha Yoga. It comprises of 12 sequential steps. One goes from one step to the next in a fluid way with coordinated breathing. This combination of physical exercise and breathing acquires a form of meditation that is helpful in creative pursuit. Medically, all life form on Earth is sustainable only due to Sun. A common chant (from Latin cantare: “to sing”) is repetitive intonations of small phrases in simple singing. Chanting has a history in most cultures, including those in the West (Eg. Gregorian chanting). Every artist who has stayed in art residency at 365 Haridwar / AZIMVTH Ashram has successfully learnt, with daily practice, accurate pronunciations of simple chants. There are about 2 dozen kinds of breath Yoga. At AZIMVTH residencies, only a few curated ones that are more relevant to arts / creativity are practiced. These are – Bumble Bee (Sanskrit: Bhramari), Alternate Nostrils (Sanskrit: Anulom-Vilom or Nadi-Shuddhi). It is good for everybody, especially performing artists. Multistep guided imagery that leads to repeating a resolve expressed in few words in mother-tongue has been found to be very useful for mitigating shortcomings that are holding a person back in realising fuller potential. Satsang literally means true company. During this session a short talk is followed by longer discussions. During the residency various curated and participant preferred topics are discussed. Shavasan, the literal translation of which is Corpse Pose, is used more in the form of a relaxation process than just a posture. (Sanskrit: Pravachan) is like the Topical / Contextual Discussion with less emphasis on discussion. The curated list of the topics is modified as per the profile of the participants. A basic introduction to the Sanskrit alphabets is given and writing them calligraphically is practised. (Sanskrit: Shastra Artha) Participants sit in a circle, with all being equals, and share ideas on their practice and art projects. It is more like a benign critique. Three kinds of Yoga breaths (Sheetali, Sheetkari, and Sadanta) combining movements of tongue, lips, and teeth help cool down body, and calm the mind. Tratak (Sanskrit: to look with focus) is an esoteric multi-step technique of meditation that involves progressive staring at a candle flame in a dark room. The control of the blink reflex stimulates the pineal gland. Tratak AZIMVTH extends this Yogic meditation to creative visualisations. To participate, please complete the online application form; the weblink is given below.